To get started with the app you sign into the service with your Facebook, Yahoo or even Google details and then you’re given a basic tutorial into the new app and the gestures you’ll need to navigate around it. 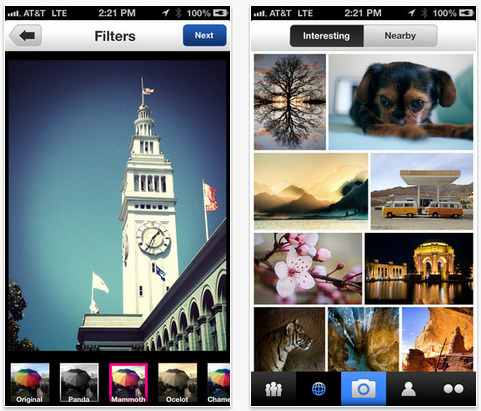 The new offering feels a lot like Instagram (but what photo app doesn’t right now?) with its stream of activity, favouriting with a double-tap functionality and groups of users. As you’d expect there are also a number of filters on offer too, which means you can take, edit, share and ultimately store photos all from the same app. Flickr has long been a firm favourite for storing, sharing and showing off your images, whether you’re an Average Joe, amateur photographer or Getty. However, this latest update could be just what the service needs to make it all about snapping and editing images too, unless we’re too stuck in our ways with our current favourites that is. The new Flickr is available from iTunes for free if you don’t have it already, or just hit update and you should see the changes.